JFleet from Jarca is a cloud-based transportation management solution designed for TL, LTL, and Intermodal road transport companies. 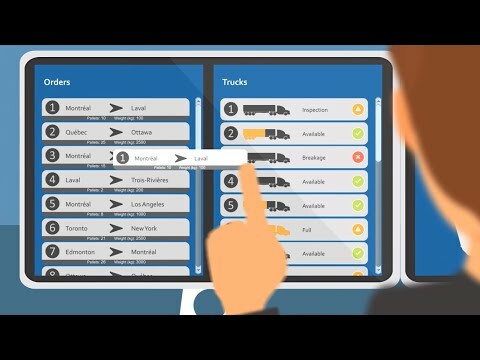 JFleet is a web-based solution that offers a wide array of features to assist businesses in streamlining routine operations such as dispatching orders, tracking vehicles, communicating with drivers and sending invoices to the customers. JFleet solution helps to automate daily routine tasks such as order management, driver management, and customer interaction. The solution provides an overview of the entire business activities and operations on a single screen. JFleet solution is equipped with a geo-tracking tool with GPS connectivity and helps track the exact location of drivers and vehicles. JFleet is built using an intelligent distribution architecture that allows businesses to assign deliveries to the appropriate drivers, eliminate dispatching errors, and optimize daily routes to save time and fuel costs. With JFleet's driver tracking software, backend operators have complete visibility on the fleet's location and its movement. The solution helps to record maintenance schedules for equipment and vehicles as well as sends reminders about upcoming maintenance schedules. JFleet also offers a mobile application for field drivers that enable dispatch managers to communicate with them. The advanced dashboard provides an overview of global business performance and tracks key performance indicators in real-time. JFleet offers an integrated billing and payroll management module that automates the entire billing, invoicing and drivers' payroll distribution process. The solution also integrates with EX-Ship Placarding software to identify and transport hazardous materials. JFleet is widely used by fleet owners across the United States and Canada. We are glad we choose JFleet as our new dispatch software. We compared many and jfleet is the most complete, robust, flexible and user friendly dispatch software out there. I highly recommend it.JFleet is a great solution for our routing and dispatching software. It has taken us to one easy to use platform that performs seamlessly each day. It is very reasonably priced and is the complete solution for our logistics needs. Still working out new features - and some steps are more manual that I would prefer. I will say that whenever we go to the Jarca Team with software improvements or bugs, they are very quick to respond and implement the changes. An online demo is available. •	JFleet provides tools that allow dispatchers to anticipate and plan routes efficiently and simplify the decision-making process. •	With JFleet, backend managers can closely monitor occasional exceptions such as wait times, late deliveries, and unauthorized stoppages. •	With geo-tracking dispatching operations, users can anticipate and secure deliveries safely and within the time allocated. •	The solution also allows on-field drivers to capture delivery photos and e-signatures from their smartphones as a proof of delivery. •	With JFleet's advanced communication tools, backend administrators can deliver instant messages to carriers and get real-time delivery updates. Below are some frequently asked questions for JFleet. Q. What type of pricing plans does JFleet offer? Q. Who are the typical users of JFleet? Q. What languages does JFleet support? Q. Does JFleet support mobile devices? Q. Does JFleet offer an API? No, JFleet does not have an API available. Q. What other apps does JFleet integrate with? Q. What level of support does JFleet offer?